Where Should We Put our Dishes? After the all the demo, clean up, and then appliance shopping, the next item on our list was to put in our order for the cabinets. We absolutely should have started searching for cabinets sooner than we did. Depending on where you order your cabinets from, they can take a while to arrive. Like, months. So, if I could go back in time, I would have spent more time upfront looking at appliances and cabinets, and doing the demo while we were waiting for the cabinets to be delivered. It may have saved us a few weeks of kitchen-less living. 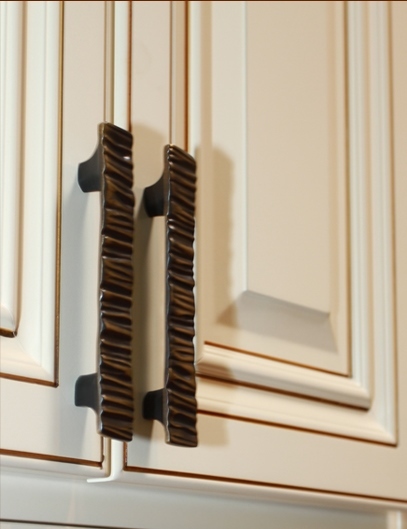 As newbies to this whole cabinet thing, we started our search at a big box store, Home Depot, to see what was available. We walked around the kitchen section for a bit, looking at cabinets we liked. We already had a pretty good idea of what we wanted – simple white shaker style with all wood construction. 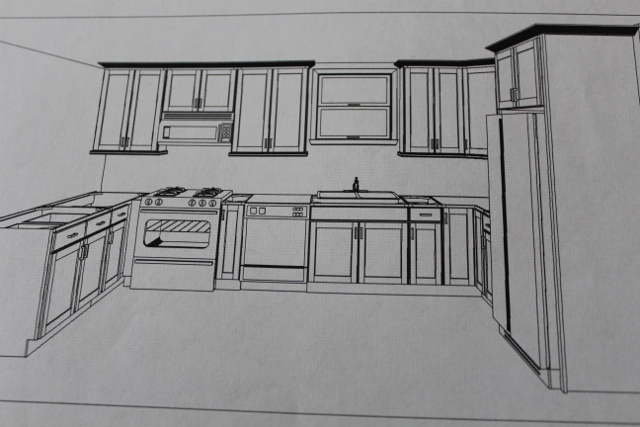 A designer quickly found us and asked us to sit down with her to plan out the kitchen. We came prepared with measurements, which were essential. To my surprise (and dismay), we sat with her for the next three and a half hours trying to determine a layout that would maximize space. It was extremely time-consuming, but I was glad to have the help of a professional. Figuring out how best to get in a bigger sink, debating the merits of a blind corner vs. larger cabinet with a lazy susan, and determing whether an over the range microwave or range hood was the better way to go was a much easier process with the help of a designer. Finally, in hour four, she drew up the blueprint, which I loved in terms of look and functionality. Grand total: $25,000, with delivery in 8-12 weeks! Whoa! We said we would get back to her and hightailed it out of there. We were crushed – how could cabinets be so expensive? We needed to figure out some other way, since $25,000 would absolutely break the bank. Plus, 8-12 weeks of no kitchen wasn’t in our game plan. We shared our experience with a contractor who was at our house, finishing our hardwood floors. He told us to try a different place, Rock Counter, in Elk Grove Village, where he regularly bought cabinets for his clients. We took his advice and headed in the next day. Remember, at this point our kitchen cannot move into the next stage until the cabinets are in place, so every minute our order wasn’t in was more time we’d be living without a kitchen. We walked into Rock Counter, and were again helped by a kitchen designer. We brought the plans from Home Depot with us, as we were happy with the layout, just not the price Home Depot quoted. We looked around the showroom, but didn’t see exactly what we were looking for. The only white cabinets were a bit more ornate than we wanted. The designer told us they only offered seven styles of cabinets, with little room for customization, but the trade off is that all the cabinets were pre-made, stored in a local warehouse, and ready to be delivered within days. Days! I did a little happy dance and thought buying cabinets that weren’t exactly what we wanted was an OK trade off for a quick delivery. The cabinets were quickly priced out, and it ended up being around $4,500. Whew, that price was much easier to swing. We took her quote and headed home, pretty sure we had found our cabinets. We had one last shop to check out, which was the place where my parents got their cabinets when they remodeled their kitchen in 2005-ish. It was a local cabinet shop owned by a retired fireman that my dad knew. 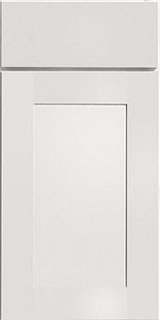 Once again, we brought in our plans, picked out a cabinet style (the Montresano style from Merillat), which was the pure white shaker style we originally liked. Look at those clean lines! The designer there priced it out, and the quote came in around $7,500. Along with the higher price, the cabinets would also take about five weeks plus shipping time for the cabinets to arrive. I asked why the long wait, and we were told that there were no stock cabinets sitting around in a warehouse. All cabinets are built to order in North Carolina. We thanked her and left, thinking waiting 6-ish weeks for cabinets was just too long. We were planning to head back to Rock Counter and put in our order, but I felt hesitant. Those cabinets weren’t really my favorite. Plus, they were not all wood construction, as Dan had wanted. But, they were the cheapest, and would be delivered quickly. We hemmed and hawed over the decision for a few more days. Eventually, we decided to go with the local cabinet shop. Those cabinets were truly what we wanted, and the price was in line with what we were expecting from the get go. Plus, I felt more comfortable that should something go wrong with our order, the local shop where my dad knew the owner would be easier to work with to make it right. On the morning of my 29th birthday, we headed into the store, ordered the cabinets, and crossed our fingers for a quick delivery. We tried not to think about the fact that we just resigned ourselves to another 6 weeks of washing our dishes in the basement laundry sink. On an an unrelated note, I ran to Target the next night and stocked up on paper plates and plastic silverware.